This article will show you how to fix "The operating system on your PC failed to turn off properly and needs to be repaired" error on Windows 10/8. Shutdown process in Windows should be carried out properly. Whenever Windows is turned off due to power cut or similar factor instead of opting Shutdown option, you may face issues later, when you turn on it back. This article refers to one such issue we came around recently. The operating system on your PC failed to turn off properly and needs to be repaired. If you’re also experiencing this issue your Windows 10, you’ve already landed to right place for the solution. Here is what you can do to fix it. 1. Press F8 key when this error screen comes up. 2. 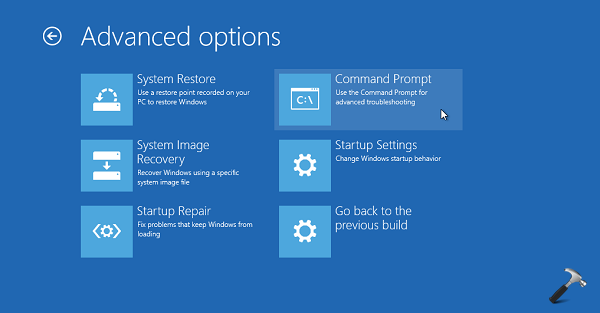 On the Advanced options screen, select System Restore recovery option. 3. Follow on-screen instructions and select restore point dated before this issue started. For reference on how to opt for previously created restore point, you can refer steps 7-10 of this guide. Once System Restore is completed, you should be able to boot normally, without the Recovery blue screen. This error might come up as well, if Boot Configuration Data (BCD) file is corrupted. You need to fix it to solve this issue. 2. Then in the Advanced options screen, choose Command Prompt entry. 3. Last step will result in opening of Command Prompt at boot. NOTE: You have to substitute C: with your system root drive. 5. Then you can close Command Prompt and perform Startup or Automatic repair using steps mentioned here. A final reboot after performing Startup repair should let you to boot normally to Windows. ^^ Have you tried above mentioned steps? If we exit, it restarts and goes back to the 17133.73 … every time we try and reboot to apply the update, we get the error about being unable to turn off properly?